The winter flu this year in France has affected most of the country, but with the western seaboard escaping the worst of it. 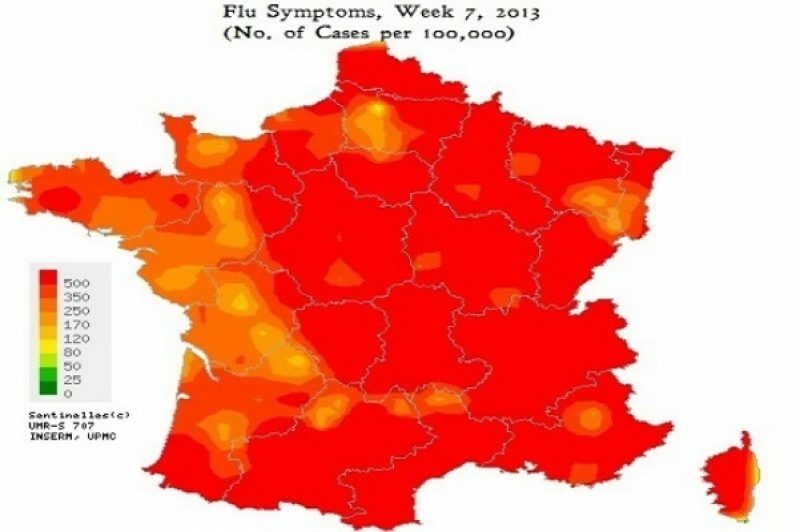 As can be seen in this map (provided by French health watchdog company Sentinelles), however, Brittany has finally succumbed to the creeping red zone. The southern departments and towns appear to be the first point of contact in a phenomenon that keeps on going. The good news for any ferry passengers travelling to France soon is that the northernmost parts of Brittany are still coloured light, indicating a healthy disposition for Roscoff and its environs. An epidemic is defined as a situation where 159 cases or more are presenting with symptoms of a common disease out of a population of 100,000. According to Sentinellles, last week in mainland France, there were an estimated 878 cases reported per 100,000 inhabitants: more than five times the official epidemic level. The epidemic is expected to abate over the next week or so. Meanwhile, if you’re going to France, try not to get sneezed upon.